Earlier this week I discussed plans for Lakefront Trail separation between Ardmore and Montrose (which will add a half-mile to the bike route and eliminate a couple of street crossings), as well as the Chicago Park District’s strategies to prevent crashes at the intersections of bike-only and pedestrian-only paths. It looks like there will be a ribbon cutting any day now for the new stretch of bike-only trail between North and Fullerton — striping and a new shortcut access path from Fullerton were recently completed. So I thought I’d share a few pics from a spin I took on it yesterday. The new trail isn’t technical open yet, but plenty of cyclists are already using it. If you’ve checked it out, what do you think — is being closer to Lake Shore Drive noise and smog outweighed by having less trail traffic to deal with and interesting, slightly elevated views of the lake? So does that means pedestrians should not use this trail and bicyclists shouldn’t use the old path for that stretch? Ideally yes, but there is definitely bound to be some cross-use. Did they get rid of the gravel running path to get the new bike path? I’ve ridden it now a few times and love it. The only negatives I saw were that the new path is very close to the noise and exhaust fumes of Lake Shore Drive motor traffic, and that it’s new asphalt covering what was permeable grass/sand. The positives are that it provides so much more room for all trail users, hopefully mostly bicyclists, and provides separation from the crazy volleyballers in summer, and the pounding waves during the other months. It also provides a nice fairly direct route all the way from the chess pavilion area to the Theater on the Lake, and allows bicyclists to avoid that horrible merge point at the base of the North Avenue pedestrian bridge. I wish there would be an adjustment of the signals where the LFT crosses North/LaSalle. Right now, there is an unnecessarily long red light for LFT users in order to accommodate non-existent motor traffic. I don’t mean to complain, separated paths are definitely better than what we had before, but I am not very comfortable riding next to LSD with cars going 50+ mph and only a few feet and a chain link fence between us. 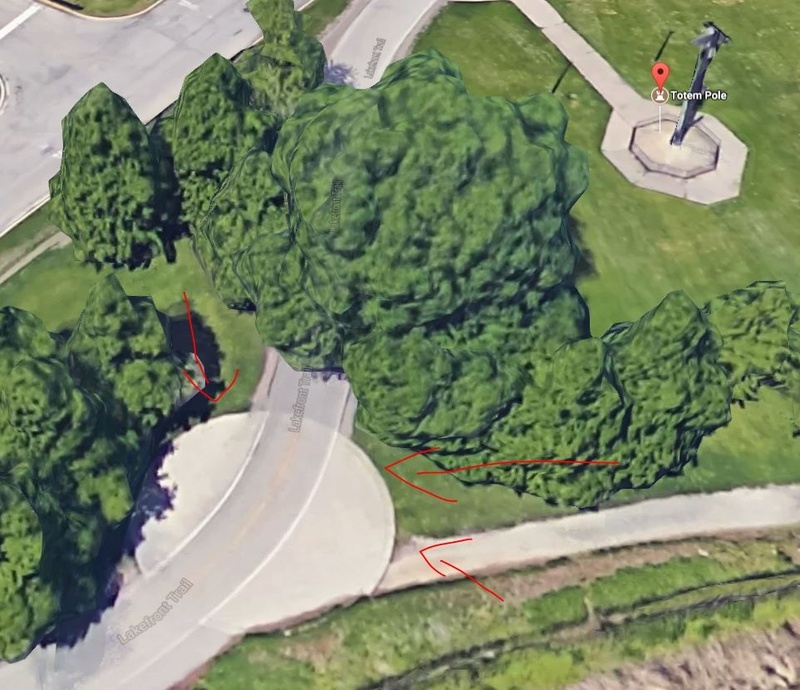 I got used to taking a detour through the zoo parking lot this summer and I will continue to use that route until a proper barrier is installed between the bike path and LSD. Or in the winter, when there is very little pedestrian traffic, I’ll be riding on the ped path. Agreed and there is. I am pretty sure there have been road sensors in use for decades for these kinds of situations, as we had them in Urbana Champaign when I went there in the early 90s. This really isn’t/shouldn’t be that complicated. Well it’s not a chain link, it’s an actual guardrail, but you’re right on. Many places where LSD and the LFP are in close proximity have very minimal or non-existant barriers. I’ve seen enough news reports of cars barreling off LSD to be concerned. You also touch on an interesting topic that had never occurred to me: what are the riding conditions on the bike path going to be like in rain/snow/sleet? The stretch between Oak St and North Ave is no picnic with the spray from northbound LSD when it’s wet out and cars are moving at a good clip. It will be convenient for pedestrians to use the bike path when the ped path is frozen over from waves splashing over it. Two things that do actually make it complicated are that it’s the intersection of two IDOT-jurisdiction streets (so the city can’t re-set the signals, I presume), and sensors can’t detect whether a driver intends to go straight or turn left onto the on ramp. There’s plenty of car traffic at the intersection, it’s just that a tiny percentage of it goes directly east, into the North Avenue Beach parking lot, but the red light is on for LFT users anyway the entire time. Not making excuses for anyone here, just pointing out other factors. Getting rid of that parking lot would be my first choice, personally, but that area also serves as a bus turnaround, which is needed. It’s great! And one aspect isn’t being touted enough. We don’t have to ride right next to the water’s edge at Fullerton and risk being washed into the lake on high wave days! I can certainly appreciate there always some complicating factors, but I doubt that either CDOT or IDOT has investigated this and decided the hurdles are too great/the technology doesn’t exist; you have to acknowledge there is a problem before you can solve it. So as a lifelong user of this stretch I would agree that the sticky wicket would be teasing out traffic looking to get on to LSD from that looking to get to the lakefront, which as you note is very low. More importantly for bike commuters, traffic demand to cross the LFT is virtually non-existent during morning rush hour, and is not much greater in the afternoon rush (that lot is not that big, so they shut down access to it regularly as is, and not many people choose to leave the beach during rush hour for obvious reasons. Most cyclists (and pedestrians) simply ignore the red light, as it just doesn’t seem in any way relevant for the LFT users. I have encountered a car that careened off the drive into the rain in the am rush near Belmont. It was scary. I think about the thin gap with cars a lot. I saw a car run another car off off LSD, southbound just north of Diversey. The car perp used the Lakefront trail as a getaway bridge across the Diversey inlet, before they hopped the curb back onto LSD. Terrifying. I love the new trail split (although I agree it is very close to LSD traffic). BUT, when is the trail near the totem pole going to be fixed? That dumb round cement thing has huge cracks and ruts where it meets the trail, and the cut curbs just north of here at Belmont Harbor Drive are in the same condition. Why has this part of the trail been neglected? The northbound side got a small, eight inch wide asphalt patch to laughably “help”. Many bikers just ride on Recreation Drive to avoid that stretch, which makes for issues when they re-enter the path near the tennis courts. WHAT IS THIS ROUND CEMENT THING THAT IS THE BANE OF MY RIDES??? I’ve come across a couple of confused drivers who have mistaken the lakefront trail for a road. I hear you, but…personally I prefer that (it had some charm, at least if you avoided getting soaked!) to being separated from the lake and next to all the traffic. Just how much extra pollution are we breathing in? – there’s not a lot of air to dissipate it.